The chili paste I am using on this occasion is a very mild one indeed. With other varieties, you may wish to cut down the amount as we only want a hint of fire. This is not supposed to be a very spicy hot dish. First, mix the chicken with the sesame oil and rice wine and set aside to marinate for thirty minutes or so. 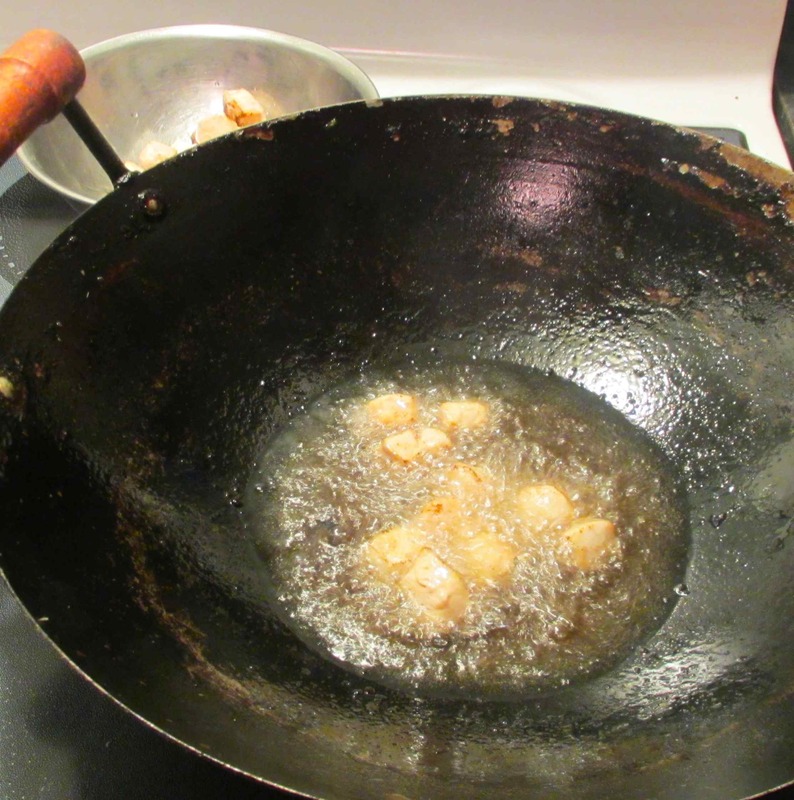 Heat a cup of oil to the shimmering point in your wok and quickly fry the chicken pieces in several batches until they are opaque and getting slightly browned. Don’t overcrowd the pan so much that the oil temperature drops too much, and don’t overcook. You just want the pieces to be nicely cooked on the outside but still just a little raw in the center. 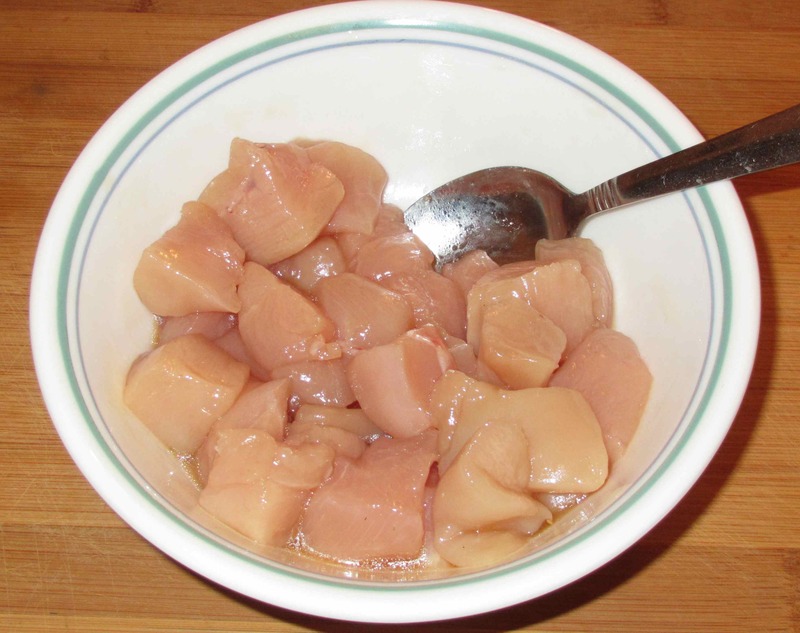 Remove the chicken to a separate bowl for now. 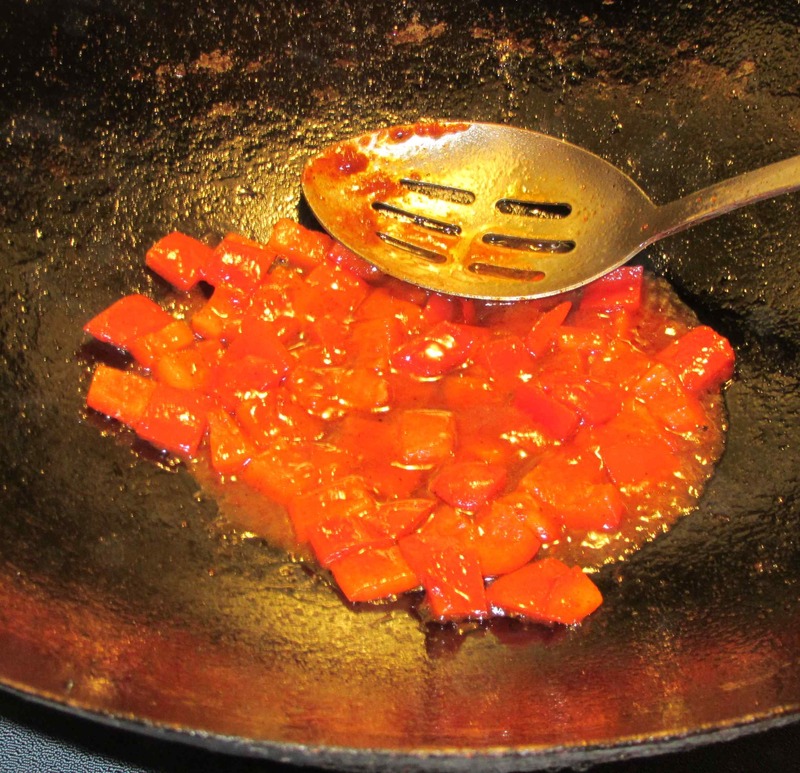 Drain off all but a tablespoon or two of oil and add the chili paste and the ketchup. Stir it into the oil and, as soon as you smell the aroma of the two, add in the bell pepper. Toss for thirty seconds or so and add the sugar and the vinegar. 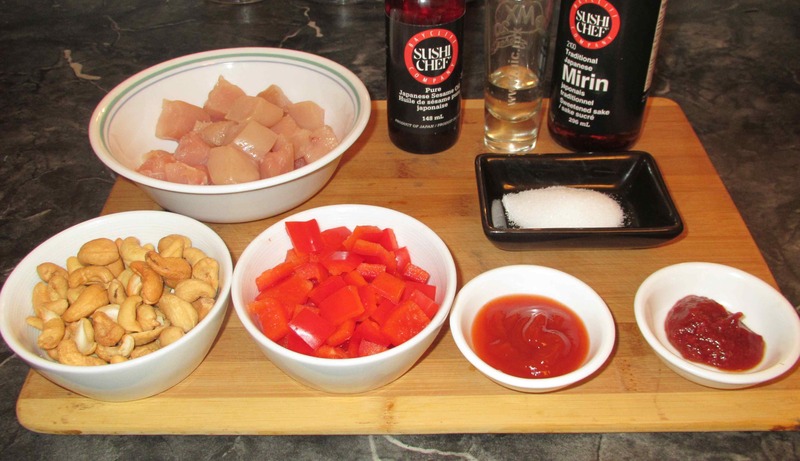 When the liquid in the wok is bubbling nicely, add the chicken and stir-fry for a few minutes until the chicken is cooked through and the sauce is forming a glaze. Now (excusing the lack of a picture here) add the cashews, toss a few more times until everything is nicely hot and then plate and serve. Well, this would have been very good but, as I ate, I began to get a suspicion that the chicken may have gone off a bit. It was mostly okay but there were definitely a couple of pieces that were not quite right and I didn’t finish. Anyway, the sauce was fine. The chili didn’t give much of a sensation of heat except as a note in the aftertaste, and, instead, it merely lent a background warmth to the main sweet and sour tastes. Cashews, of course, are always a winning combination with chicken. Please give it a try (just use really fresh chicken!!). Very Nutritious too. I haven’t tried cooking with cashews yet. May try one day. You are sooo Chinese! I did the same thing sometimes. Thanks. 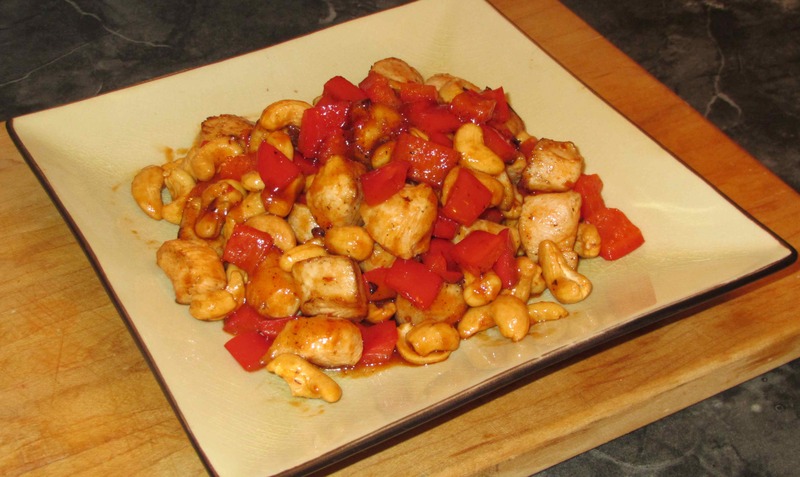 From “the Wife`: I must say that cashews add SO MUCH to so many recipes. John does this VERY well! Oooh I have a bottle of mirin and now i’ve found something to do with it – cheers! Chicken and cashews sounds delicious right now!